The Ark Nelson is a non profit organization that takes young people on a journey of self-discovery while working with abandoned rescue dogs, by doing this these amazing young people find their own power in kindness and compassion. So you need to come to their Open Day and check them out, plus they are celebrating their 10th Anniversary. They will be combining this day with Stonehurst Farm which is promoting their new horse arena. 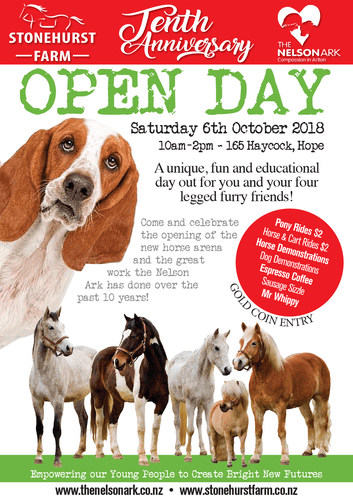 A great fun and educational day out for your and your four legged furry friends! Pony Rides, Horse and Cart Rides, Dog Demonstrations, Bouncy Castle and Mr Whippy.